I thought I'd show you some more rooms in my house decorated for Christmas. That's what everyone is doing this week, isn't it? I actually have another room to work on this month that isn't Christmas related. My oldest son's room will be getting a makeover. I have never shared it with you because it has always been a typical teenagers room which is ALWAYS a mess. So, we're going to be cleaning and painting his room soon. I dread it though, because it's going to be a lot of work, but it really needs to get done! So, back to the rooms that ARE done and have some Christmas cheer in them. We decided to purchase a new tree this year. It's a simple 5 ft pre-lit tree. We dreaded the large one we had to put together every year and it took up so much room. So, now we have one that is very easy to deal with. However, my 12 yr old isn't a huge fan. He said that the tree belongs on the floor, not a table. LOL! We put it in this large galvanized pot to give it some personality and make it look more country. I draped a folded tablecloth over the table for color and added some burlap bunting, that I made last year, for interest. I hung simple red and white decorations on the tree that have a homemade feel. By the way, it is an ugly day outside, so my pictures aren't very bright right now. And, I don't think it's going to get much better this week. So that's some Christmas cheer in my foyer and front sitting room area. Hope you are having a good week so far and getting your Christmas decorating completed too. Soooooo pretty Kelly...love all the pops of red!! Your tree looks great and I love how you put it in the galvanized bucket! That looks so cute!! Love the bucket and my favorite thing is the rake. It looks really pretty, Kelly! 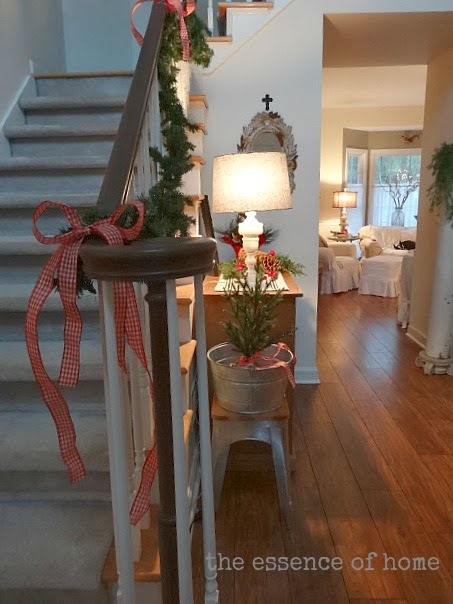 I love the new tree with the burlap bunting and the garland and bows on the banister. Very nice touches! I felt the same way a few years ago about our huge tree. it was left up to me to decorate it, and I just wanted it to be easier. 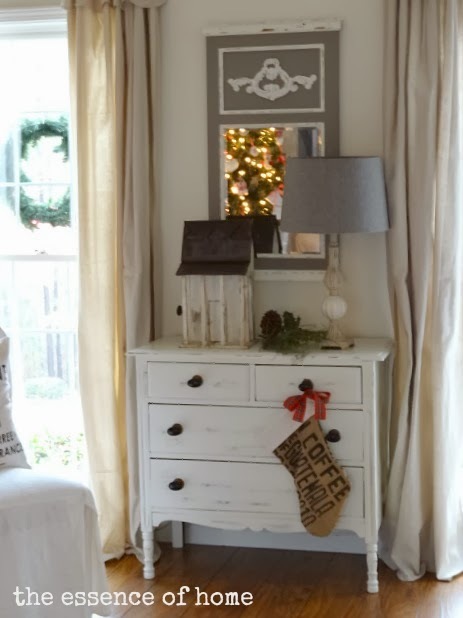 love all your beautiful Christmas decor! Kelly, you've been busy! Love all of your holiday touches. Love the tree on the cute little table. The pops of red are the perfect accents! Your room and tree look great! Enjoy! 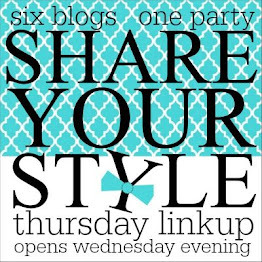 Please check out my blog this week as I am hosting my first giveaway! My daughter wants to cut down a big tree, but we have the issue of a small cottage and a new puppy. I am thinking a tree on top of the cedar chest will be just perfect. It is all so pretty. I love your new tree in the bucket and the red and white on the stair rail is awesome. Love all you little touches of red. So pretty. Everything looks so festive and pretty! I love your new tree in the galvanized tub...very cute! We did the opposite of you and went with a big tree this year. LOL!!!! LUV the tree in the galvanized tub! I did one of mine in a bucket :-). Will be posting photos soon. Everything looks so festive!! Loving the Nordic look!! Tell your young son that I'm with him on this one. Always so cheery at your place Kelly, I used to use the red and white ribbon too but got away from it when I changed my decor. I love it on the banister and love the galvanized tubs that you are using. Oh, Kelly. Your home looks so pretty and festive. You are much faster than me. My tree is in the den and some of the lights don't work. My husband said get a new tree next year I can't fix those lights. I hate to buy a new one but I guess everything has a life span. I guess I'll decorate it and ignore that some of the lights don't work. Love all of your greens and pops of red here and there. 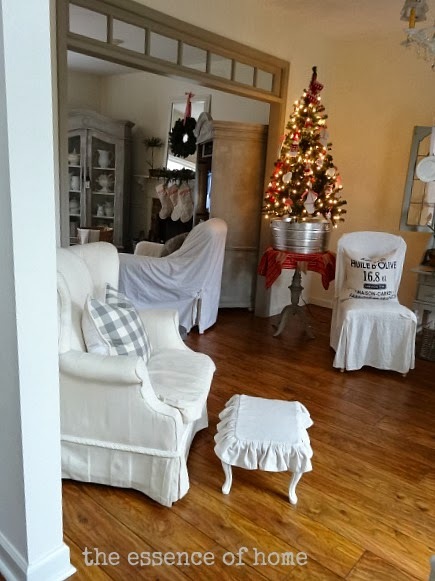 Your home looks beautiful at Christmastime, Kelly! Everything you've done looks just right! It's very festive without being over done. The tree looks darling in the tub, and I love all of the natural elements that you used. The tiny tree in the foyer is adorable! I love your tree in the bucket. I almost bought one at Target today but I was in a rush. Love your simple Christmas accents. 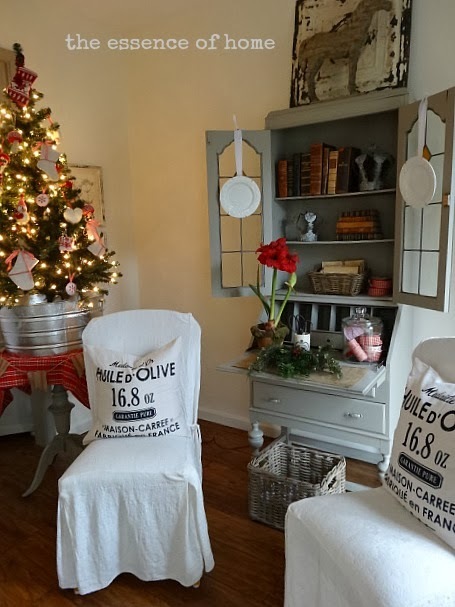 Just love all of your Christmas decor Kelly….I wanted to downsize my tree this year, but did not find the one I wanted without paying a fortune for it…so the 12 footer went up…Your house is looking so very festive Kelly…anxiously waiting for more of your creations! 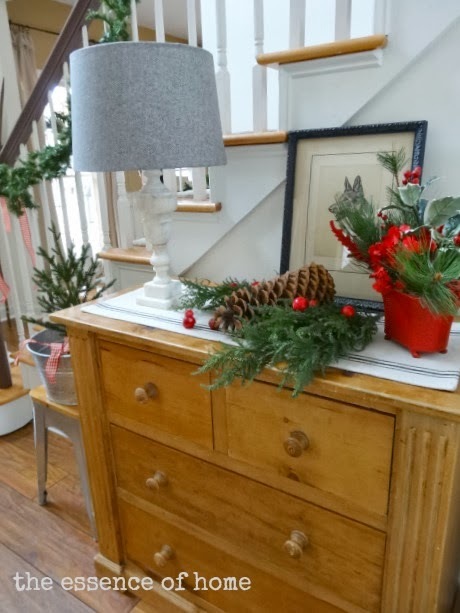 Love your Christmas décor with the touches of red. I also love the country feel that it has. Everything is so pretty!! 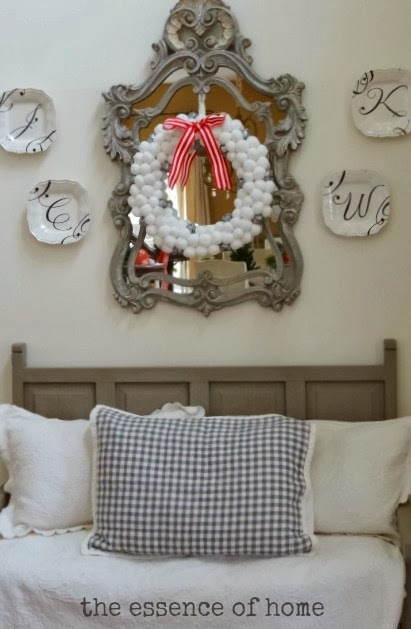 Love all your holiday touches Kelly! Hope you and your family have a wonderful Christmas. Perfect touches, Kelly! I especially like your styling of the secretary. Your Christmas décor is so pretty Kelly. I love the tree in that container. When I mentioned a few post back that I bought a tree, I meant a fresh one not a new tree...though we are thinking about finally going that route next year. Yours looks beautiful. We finally bought a tree like yours at least 10 years ago. I still love it, and it has certainly paid for itself by now. We even put ours away decorated, slip an extra large plastic bag over the top to keep dust off. Now every year it takes about 10 minutes for my husband to bring it out and 'ta da' there it is- decorated! Love this idea. It all looks wonderful ~ the greenery and touches of red work perfectly in your home! I've been trying to talk hubby into a smaller tree - still working on that. Maybe I'll have to show him how cute yours looks! Beautiful Kelly! Love your tree in that tub...gorgeous! Kelly, can I just say LOVE!!! I love everything pictured. That mirror over the bed is gorgeous and those trees are all so pretty. Love the galvanized tub!! Your understated decorations are really beautiful!! I especially like the simple garland on your stair railing. love the smaller tree with the "homemade" ornaments. Simple really is best...for me. Beautiful, Kelly! 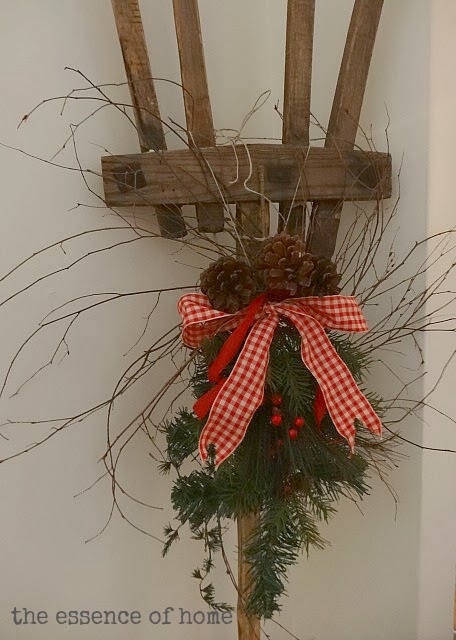 I love your pops of red, and that you placed your pretty tree in the galvanized pot … love that idea!! Happy Holidays! 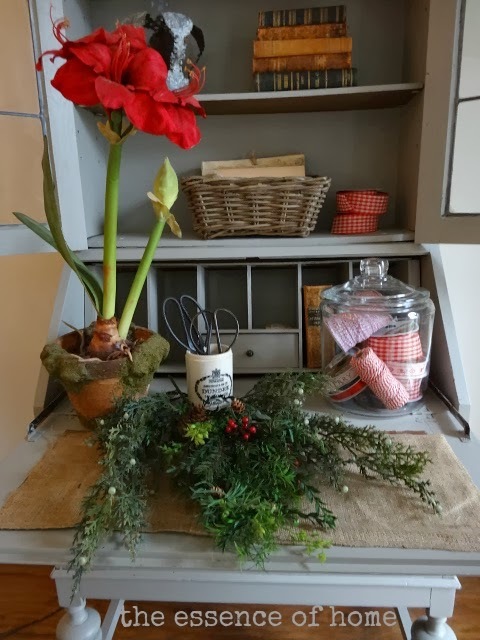 Beautiful Kelly, I have the same amaryllis in the mossy pot...love it! Your home looks so wonderful and festive for Christmas.